The goal of this book is to describe new concepts for Internet next generation. This architecture is based on virtual networking using Cloud and datacenters facilities. Main problems concern 1) the placement of virtual resources for opening a new network on the fly, and 2) the urbanisation of virtual resource implemented on physical network equipment. This architecture deals with mechanisms capable of controlling automatically the placement of all virtual resources within the physical network. 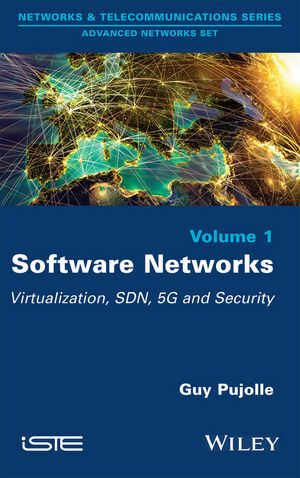 In this book, we describe how to create and delete virtual networks on the fly. Indeed, the system is able to create any new network with any kind of resource (e.g., virtual switch, virtual routers, virtual LSRs, virtual optical path, virtual firewall, virtual SIP-based servers, virtual devices, virtual servers, virtual access points, and so on). We will show how this architecture is compatible with new advances in SDN (Software Defined Networking), new high-speed transport protocol like TRILL (Transparent Interconnection of Lots of Links) and LISP (Locator/Identifier Separation Protocol), NGN, IMS, Wi-Fi new generation, and 4G/5G networks. Finally, we introduce the Cloud of security and the virtualisation of secure elements (smartcard) that should definitely transform how to secure the Internet. Guy Pujolle is currently Professor at University Pierre and Marie Curie (Paris VI) in France and a member of the Scientific Advisory Board of Orange/France Telecom Group. He has published widely in the area of computer systems modeling and performance, queuing theory, high-speed networks, intelligence in networking, wireless networks, and Post-IP networks, including 19 influential texts and monographs in these areas.